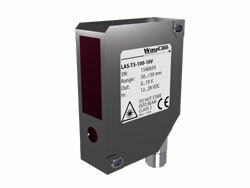 Waycon: The distance sensors of the LAS-T5 series from WayCon Positionsmesstechnik enable reliable, reproducible measurements, e.g. for factory automation, in keeping with the Industry 4.0 theme. Alongside positional measurements in industrial automation or distance measurements in quality control, the sensors are also suitable for measuring the thicknesses of various objects. Depending on the model, measuring ranges between 30 and 600 mm are available. Using the simple teach button process, the desired range can be easily adjusted. The robust sensors are classified as Protection Class IP67, are vibration resistant and are highly reliable, even in ambient light. Their strong performance is evident in the fast measurement frequency of 1 kHz (1 measured value per millisecond). The analogue output signal (4...20 mA or 0...10 V) allows connection with virtually all receiving electronics worldwide. The sensor is automatically recognised by modern measurement data collection systems like QuantumX by HBM and can be used immediately and with any chosen PC software – “plug in & measure”. For this purpose, WayCon provides the corresponding pre-assembled sensor cable with a sub-HD plug-in connector and a programmed TEDS chip which contains all the relevant sensor information. This is of course available for all positional sensors in the range. WayCon Positionsmesstechnik GmbH has been developing and manufacturing precision sensors for position and distance measurement since 1999. As an innovative company with headquarters in Taufkirchen near Munich and a branch in Brühl near Cologne, we sell our products all over the world. Our goal is to provide our customers with the best possible measurement technique solution: from high-quality sensors from the standard range to customer-specific solutions, from prototype to series production – for the most varied applications in industry and research. The products made in Taufkirchen are subject to rigorous quality standards and every single one is delivered to our customers with a calibration certificate.